What do chores look like in your home? Do you have a rhythm in place for doing what, when? Or are you more of a freestyle homemaker, fitting things in here and there when you’ve got the time and/or energy? Not that there’s a right or a wrong way, of course! These details are up to you. They way you care for your home is a personal matter, and the method in which you choose do so is more of a reflection of your personality than your ability to organize a closet or scrub a tub. I am someone who prefers to do certain things on certain days to break up my work so it’s more manageable, simplified, and enjoyable. 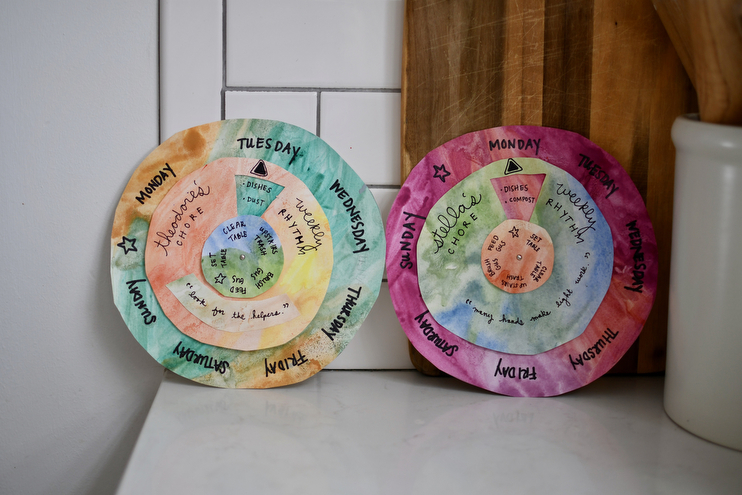 I crafted this Daily Rhythm for Weekly Chores to help me flow during the week, serving as a daily reminder to slow down and root myself in presence amid the rushing chaos of life, and sometimes, life at home. It helps me, and perhaps it can help you, too. Chores are notorious for getting slammed, being called “drudgery” (among other choice words) and creating resentment within the home. For these reasons and more, they tend to get bad rap. I mean, I get it to some extent, given that they are indeed repetitive, require little attention to complete, and are often done behind the scenes and between the lines, therefore without much appreciation. But why must we complain, complain, complain about them? What if instead, we chose to see chores differently? Yes, that would require some work on our part, but isn’t it worth it for the things we do everyday? I think so. Why not see these ordinary things we have to do within our home, as extraordinary things we get to do within our home? Who says we cannot change the lens? Or at least take the time to reframe how we choose to see home care from time to time? It is for some of these reasons I’ve mentioned above (and more, I am quite sure) that many people tend look down on chores and end up cursing them in the process. While I don’t think I’ve ever heard of anyone get exceptionally excited about moping floors and peeling goo off the walls, I do think that attitude and intention is everything when it comes to doing anything, as it forms the way we see the world thereby shaping our experiences as we move through life. This applies to chores too, mundane or otherwise. In light of this, it has been our focus as parents to help our three kids understand that caring for our home with mindfulness is another meaningful way we are caring for both ourself and our family. It takes a shift in perspective, but once you see how home care = self care, work done within the home becomes work done for the home and those who live there, therefore becoming more of a priority and less of a burden. And this doesn’t mean that your house should always be tidy and void of dust bunnies, no no no. What it means is that when you view your home, you can choose to do so with intentionality and gratitude, thus holding space to see the environment that you live in as a place that will nourish and nurture you, if you choose nourish and nurture it. Homes are more than containers for our belongings and a place to rest our heads: they are a part of us, and can be tremendously life-giving if we open up to see them this way. This is a gift we can give our kids, and they are waiting to lend a hand. The sacred relationship one build’s with their home can either help or hurt, and showing our little ones the value in caring for their environment is a tangible way to teach this. You do not need to clean all the time becoming a martyr in your home to achieve such lessons. In fact, please don’t. I beg you. Home should be a place of work, play, and rest. Instead, choose to talk about chores in a positive tone, make them fun, and if you like, create a daily rhythm around such tasks to help remind and move you through them. You and your family can work together to create a nurturing space to grow and thrive in, and while small and seemingly insignificant, chores can and will provide everyday nourishment. You’ve taken a moment to consider how you handle chores, but what about your kids? What role do they play in the daily or weekly rhythm of life at home? Perhaps you have little ones who are only able to toss soft toys in a basket, or maybe your little ones are more like little adults, inching towards independence and not too far off from making a home of their own? With age comes responsibility, along with the physical ability to handle and do more things. If you are finding that your home lacks a flow or rhythm with respect to home care, or maybe you feel that too much time and energy is being devoted to figuring out who does what when, you may find that this chore wheel can help. It’s fun for kids to help create, and simplifies matters by taking the questing out of it. Each day is assigned one, two, or three chores (age appropriate) and each week, a helpful action. 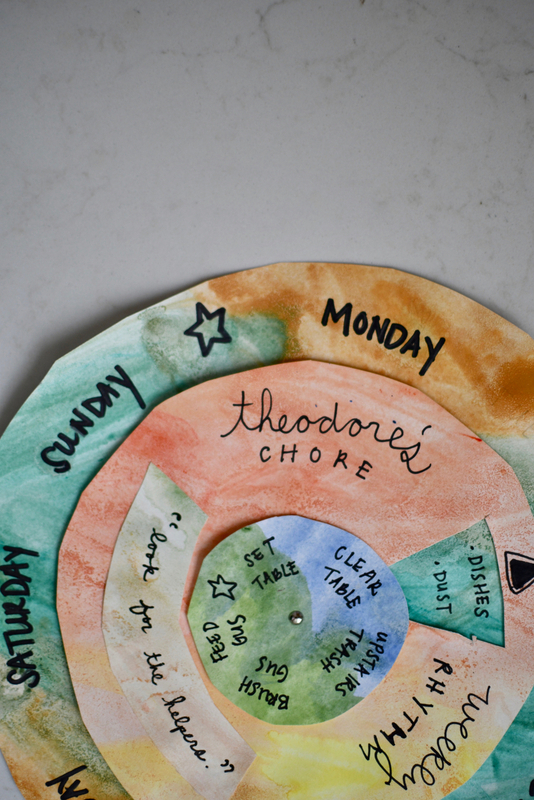 You spin the wheel each morning, and designate a certain time of day for your little one(s) to do their chores. It’s really that simple and adaptable. The goal is to help shape the family view of chores as a means of self and environmental care, with simple and helpful ways everyone in the family can chip in. In time, you’ll find that your kids will begin to sync with their daily rhythm, eventually doing their work on their own when they get a certain age. Below are the steps to make one, but know that what you choose to write on your little one’s chore wheel is entirely up to your family’s values, the needs of your home, and perhaps most importantly, their abilities. Step One: Have your little ones cover the watercolor paper with colorful designs, swirling the paint and water to create a plaster-like background. Let the paper dry. Step Two: Using a plate as a stencil, draw a large circle on the watercolor paper and cut it out. Do this twice so you have two identical circles of watercolor paper. Step Three: Trim one of the circles 1-2 inches around the edge, creating space to write the days of the week. On the trimmed circle, cut out a shape in the piece of a pie with the point facing the center. See my photos above for an example. Step Four: With scrap watercolor paper, cut a small circle about 3 inches in diameter. This will be the center circle. Stack the circles so the largest one is on the bottom, the pie cut out circle in the middle, and the smallest one on the top. Fasten them together with a paper fastener by poking it through all three circles. 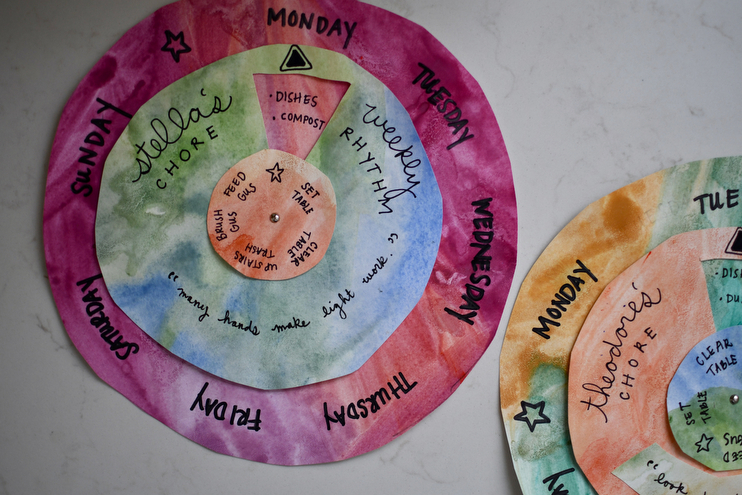 Step Five: On the outer circle, write the days of the week, spaced evenly. Draw an arrow above the pie shape, and turn it, writing chores on the largest circle in the blank space. Move through the days of the week, moving the second circle as you go. See chore guide below for age appropriate ideas. Step Six: On the smallest circle, write 5-6 helpful actions your little one can do from week two week. I choose things like setting the table, clearing the table, and feeding Gus, for example. You will rotate this every Monday. Step Seven: You’ll notice some stars above. Those stand for free days where the kids get to choose their chore or helpful action. I placed several around the rhythm wheel to keep things fresh and to give them freedom in choosing how they want to help that day. Step Eight: Decorate and write on the middle circle, adding the name of who it belongs to, and anything else you’d like. Step Nine: To use, rotate the middle circle each day to reveal new chores, and rotate the smallest top circle every new week or month to reveal new helpful actions. You can change these easily by making new circles as the seasons change and your little ones grow. Is this rhythm wheel something your family will use? And if your little ones do chores, how does that look in your home? The biggest earner is $0.25 which is to bring in the empty trashcan from the street on garbage day and feed the cat, both weekly tasks. Once a week the family does a big toy room cleanup together. He has several daily tasks as well, setting the table, dirty laundry in the bin, and making his bed. It keeps the momentum for him AND me. Once his coin jar is full he can spend half and save half. He’s currently saving for tickets to a water park this summer. Counting coins is a great math exercise. Just wash your gross hands when done!